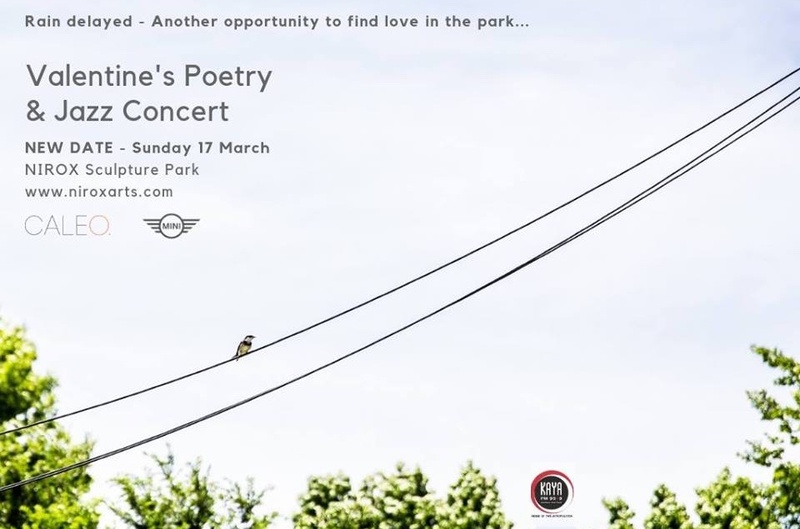 Following the sensational Highveld rains of the Valentine's week the Valentine's Poetry & Jazz Concert will now take place on Sunday 17 March. The line-up will still host a collection of South Africa’s finest poets and jazz musicians, as their current time together in the artist residency percolates for a month, and they congregate in the NIROX Sculpture Park amphitheatre to present an entirely unique programme. Guests can enjoy a full day of music and poetry, alongside the culinary excellence of the Epicurean Emporium, Bernie’s Bar and Flowstone artisanal G&T bar, set among the meandering waterways and contemporary art collection at NIROX. NITA’s Kitchen - the Summer popup restaurant in the NIROX Pavilion - is open for advance bookings only. Please contact nitaskitchen@niroxarts.com or 076 540 1766 to make a reservation. Children aged 12 and under enter free of charge. Adults: R330 online or R360 at the gate - subject to availability. MINI is an official partner of the Valentine’s Poetry & Jazz Concert. KAYA FM is the official media partner of of the Valentine’s Poetry & Jazz Concert. CALEO Wealth Management is the anchor sponsor for the NIROX Foundation’s ongoing concert programme. All ages welcome. Children aged 12 and under enter free of charge. Ample secure parking available on-site.